but everything about it feels so sub par. from the voice acting.....to the intro theme song, to the intro animation, to the series designs...to basically everything. People like most of the voice acting, and the intro theme song/animation especially is just fine. I don't get why you're saying things are subpar that most don't have a problem with. Because we're not all hive mind sheep and opinions vary? Aside from personal expectation and want, there isn't much I can say is genuinely bad about this show. The pacing could be slightly slower and it gives too little context, that's really about it. I could nitpick or tear it apart for what it isn't, but I don't want to because I don't really dislike it. I would have wanted a proper storyline, more drama and stronger connections to previous versions (that I like). The show just isn't aiming to do that, what it does aim for hasn't been done badly, so there just isn't much for me to actively hate. Compared to the three cartoons before it, what's there to really say? The Fred Wolf cartoon didn't bother paying respect to the source material, it didn't even bother with quality control. The 4Kids cartoon is the closest to what I want but there were plenty of generic episodes that haven't aged well. The last Nick show tried to do what I wanted, but most of it was about as goofy as this show, while it's attempt at being dramatic and having a story wasn't well done (I'm sorry but the storyline of that show just sucked). Disliking Rise because you liked one of the previous better seems odd to me, because they weren't that much better in all honesty. I've finally watched all 5 episodes (partial episodes? whatever) That I can find. I did not care at all for the season opener, Mutant Mayhem. Out of all the others Origami Tsunami was by far the best of them all. War and Pizza was okay, and the other two with Don and Mikey trying to get the space cruiser from the repo Mantis guy and the one with the Worm reporter who hates the turtles were just awful. They all had a few moments, but I still wasn't impressed. As the show goes on I hope the writing will get better and they will land a few more decent jokes. It's obvious by now they're isn't going to be any major plot developments and if there are, they won't carry very far, much like Teen Titans Go. They'll introduce new characters that will be completely unnecessary and soon forgotten and if that's the direction they wont to go with this than fine. I know it's directed for kids so the story isn't going to be all that though provoking beyond a 12 minute comedic short it seems... BUT... at least it's not TMNT Team Up... so I'm thankful for that. 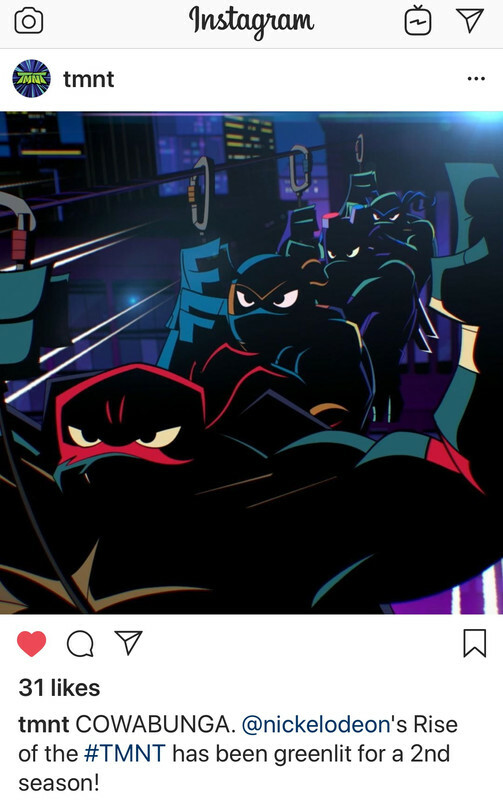 Speaking of the shorts though I can't help but wonder if they made a series like either the Vasquez Short Don VS Raph, or the Turtles in Time one that had a more "anime-ish" feel, or even the Strike Hard short, that while oddly animated was way more captivating to me then Rise has been, how successful would they have been in comparison? I see a lot of people wondering why folks are comparing this to the 2012 show. Mostly for me it's the Turtles, April, and Splinter (not so much Casey cause he hasn't been introduced yet, and also same goes for the villains) But in the 2012 series, I loved all the turtles for different reasons. It was honestly hard to pick a favorite. They all had distinct personalities and other traits that made them all very unique... so far it seems these turtles are just all the same. They LOOK very different being different species, but that's not what I mean. They seem unique, but they just aren't. Again, as the show progresses and the voice actors come into their roles easier I hope that will change a little, but Don is the only one in Rise that has any real context to him and I think that's why a lot of us are making that comparison so often as to how we went from 2012 to THIS. Last edited by drag0nfeathers; 07-23-2018 at 04:23 PM. There's no reason to compare the shows besides the fact that Nick made both of them, they're completely different. It makes sense that Rise would go in another direction, since 2012 was still a pretty traditional TMNT cartoon that followed all the same beats the franchise was known for. I've had a hard time putting my finger on it, but the kind of show this is looking to turn out to be is more the kind of thing I'd want to see in a well done fan made (or by sites/channels such as College Humor, etc) web series on YouTube. As just some crazy nonsense to kill time watching on there now and then, in contrast to an existing much more serious show, would make this into something I'd enjoy a lot more for what it is. Rather than it itself being the new canon show with nothing else in contrast to it. I love the video skits that do exist for TMNT online, there aren't enough of them... and this series kind of feels like it would be at home among them, but it's not what I want a show to be. Yes no reason to compare shows. Not so much compare shows as keep in mind the list of ingredients that make up TMNT. Lots of different cookie recipes exist but you can only change so much before it’s cake and not cookies. However, I enjoy both cake and cookies so I’m good. But I don’t call a cake a cookie when eating it. Well people can compare the Turtles/Splinter/April, etc, of course, but the rest of the show is so fundamentally different there's not much to compare. Or all the new mutants we're getting. I wasn't necessarily saying is SHOULD be compared, just making a rationalization on WHY it's probably been being compared by a lot of fans. Three seasons. But after that? Will it even be remembered? Even in a negative light? We remember the coming out of their shells tour, we'll remember this. I'm sorry? Opinions are opinions and all that but fast, great animation is fast, great animation. That entire intro is just one continuous shot. That's REALLY hard to do, especially with the level of energy it has. To say that's sub-par is a tough pill to swallow. I can certainly understand not enjoying it; all that energy might not be your thing, but something like that invokes a more extreme reaction simply because of the amount of stuff on screen in such a short amount of time, whether positive or negative. Batman has the joker. Superman has Lex Luther. Optimus has Megatron. There are characters within a universe that are staples and expected, this isn't unique to tmnt or an odd trait for the fanbase by any means. I don't mind them having different looks but personally I'm also not a fan of each being a different species, because you get into unrealistic (yes, i said unrealistic while talking about mutant turtles.) scenarios such as a snapping turtle being kept with literally any other turtle without it murdering them etc. Granted they could pick species that coexist with others fine and I wouldn't bat an eye at it. I don't mind weapon change ups but I would have preferred them doing a swap out to their magic weapons when needed akin to power rangers calling on their megazords. I'm not a fan of taking their weapons away so suddenly and permanently. Also I didn't like tonfas in TNM, I don't like them now. You're really attacking people that would like to see a return of a series they like? really? I don't even know how to address this one. My 'annoyed' responses come from the complaints I've heard about the show, before the show even aired. And I wasn't attacking the people who miss the 2012 show, I'm mocking the people who attack the new show, because it's not the old one. Also, the people working on the 2012 show finished exactly where the creators wanted it to, the way they wanted it to. As to the weapons; if you've seen the premiere, you know that issue was addressed, and the foot origami ninja is already setting up things like Leo's leadership traits. As to shredder/villain point, the foot is there, we just have a slow build to shredder, and a focus on other villains for the time being. Last edited by Panda_Kahn_fan; 07-26-2018 at 09:47 AM. the ratings didn't look all that great posted earlier. Don't forget Nickelodeon has online views too, as some episodes already up online. lolz, this thread looks desperate now. We're in 2018, not 1992. TV ratings don't mean much anymore, shows are streamed online now. How many times do we have to say the same thing? Kids today are watching cartoons on their ipads and phones or computers, not so much the TV anymore. Like most of the hate it's gotten from day one. This thread started before the show debuted and I'm not sure it's justified now either. Why wish cancellation upon a show that just started? Maybe if it's been on for years and you don't think it has improved, then I might understand it. Right now though, we only have 6 of 104 confirmed episode segments, I think you can still give it time to grow on you. It's mostly from the kneejerk reaction of the designs when they were first shown, or people like Vegita-san who assume everyone hates something when he does and goes around trolling threads about ratings when we're in the year 2018 and not 1995.